Happy Days At The Laughter Lounge. There’s a double dose of unfathomable good cheer at The Laughter Lounge in Dublin this Wednesday as two of the happiest men in the country bring their sell out Edinburgh fringe shows to the capital for one night only. 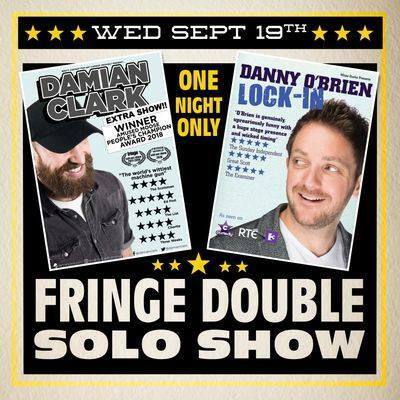 Damo ‘Ah sure it could be worse’ Clark and Danny ‘Everythings Deadly’ O’Brien take to the stage on Sept 19th to spread the love and make sure everybody leaves as happy as they are, which takes some doing. Doors open at round about you know yourself and admission is a mere trifling or two, sure don’t worry about it, it’s all wonderful…. Jesus!! it’s catching. Foil Arms & Hog featuring, left to right Foil Arms & Hog. The Dublin Fringe Festival, the worlds only stealth fringe festival is in full flow all over the city. However the festival only really kicks in on Sunday Sept 16th when Foil Arms & Hog give an Irish debut to their brand new show Craicling with a run of eight nights at the O’Reilly Theatre in Belvedere College. You know your school is posh when it has a theatre that can house the biggest name in Irish comedy. My school had a window where you could watch diseased stray dogs licking themselves and each other. Much like those poor starving animals tickets for the lads shows are thin on the ground. Any remaining tickets may be available the fringe website.